Separate the broccoli flower from the stem. Cut the flowers down to about 1-inch pieces. Peel the stems and slice about 1/3 inch thick on a slight bias. Bring a pot of salty water to a rolling boil. Add the broccoli and allow it to cook for about 2 minutes. (Test a piece to see if it is to your liking). 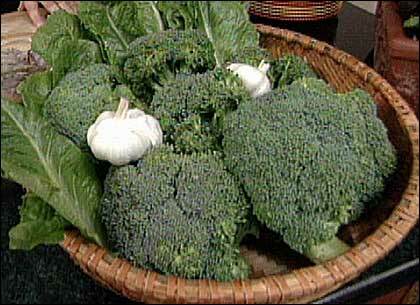 Before draining the broccoli in a colander, remove a 1/2 cup of the liquid and reserve. Heat the sauté pan on medium heat before you add the broccoli to the pot. As soon as the broccoli goes in, add the olive oil and sliced garlic. When the garlic begins to turn golden add the red pepper flakes and cook until the garlic is light brown, about 1 minute. Add the shrimp and toss in the hot oil. Cook for about 1 minute stirring 1 or 2 times. Turn the heat up to high. Add the drained broccoli and sauté for 1 more minute. Add the reserved cooking liquid from the broccoli and season with salt to taste. Remove the pan from the heat and stir in the butter. Serve immediately. 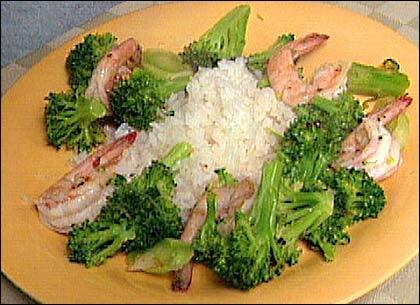 Chef Jasper White notes: This is a simple sauté where the broccoli is quickly blanched. The shrimp can be omitted (or cut back to 4 to 6 ounces) and this can be served as a side vegetable, delicious with grilled steak, chops or seafood. The most important part of this recipe is the technique for cutting the broccoli stem, allowing it to cook evenly with the flower. Serve with a neutral or lightly seasoned simple rice or pasta dish. This segment appears in show #2915.